The China Study, with 850,000 copies sold, has been hailed as one of the most important health and nutrition books ever published. It revealed that the traditional Western diet has led to our modern health crisis and the widespread growth of obesity, diabetes, heart disease, and cancer. Based on the most comprehensive nutrition study ever conducted, the book reveals that a plant-based diet leads to optimal health with the power to halt or reverse many diseases. The China Study Cookbook takes these scientific findings and puts them to action. 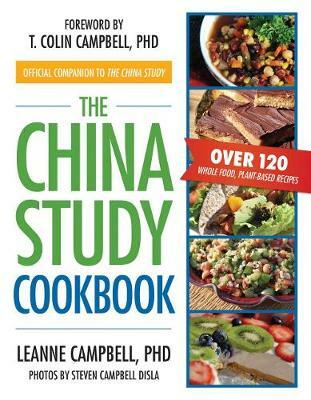 Written by LeAnne Campbell, daughter of The China Study author T. Colin Campbell, PhD, and mother of two hungry teenagers, The China Study Cookbook features delicious, easily prepared plant-based recipes with no added fat and minimal sugar and salt that promote optimal health. From her Breakfast Home-Fry Hash and Fabulous Sweet Potato Enchiladas to No-Bake Peanut Butter Bars and Cheese(less) Cake, all of LeAnne's recipes follow three important principles: 1. Optimal nutrition is based on eating food rather than nutrient supplements 2. The closer that foods are to their native states--prepared with minimal cooking, salting, and processing--the greater the long-term health benefits of eating them 3. It is best to choose locally and organically grown produce whenever possible Filled with helpful tips on substitutions, keeping foods nutrient-rich, and transitioning to a plant-based diet, The China Study Cookbook shows how to transform individual health and the health of the entire family.